Much has been written and claimed by various manufacturers regarding optical quality and wave accuracy. Some claim to use test methods capable of showing errors of 1/50th wave or smaller. Many tests require subjective interpretation by the operator, in order to compute the wave rating. Unfortunately, the best operators can't always achieve the accuracy needed to produce diffraction limited optics consistently. This is especially true with objective lenses and large fast mirrors where diffraction limited tolerances are very small. Many test methods are also incapable of showing astigmatism, a major cause of poor performance in optics, especially objective lenses. The practical wave accuracy possible in parabolic mirrors depends on many factors including substrate used, thickness of substrate, focal ratio, method of testing, and to some degree size. Manufacturer claims of 30th, 40th wave, etc. have to be looked at with skepticism. The smoothness of the optical surface is often overlooked but extremely important. Rough surfaces scatter light and cause loss of contrast and definition. Fast manufacturing techniques, while saving labor dollars, often come at the expense of a rough optical surface. All D & G Optical lenses and mirrors are pitch polished and hand corrected for a smooth wavefront. The best planetary images can only be obtained when smoothness and excellent correction are combined. 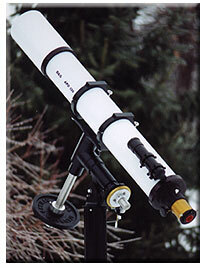 It always pays to get the best optical quality when purchasing a telescope or component. To know the image viewed at the eyepiece is as good as it can be is always reassuring. All D & G Optical lenses and mirrors are interferometer and/or autocollimation tested, to assure you of consistently superb optical quality. In these tests the error viewed is doubled and, by using certain programs, an accurate wave rating can be obtained. These tests eliminate the guesswork and assure you of consistently superb optical quality that will not vary from one optic to the next. Many large optical contractors the world over have come to trust D & G Optical for the optical accuracy needed in the most demanding and precise applications. We at D & G Optical will continue to work hard to earn the trust of all our customers, past, present and future.